In a community in Jakarta, Indonesia, Malen’s mother spends her days collecting garbage from the streets to provide for the family. Through the encouragement of the local Compassion child development centre, Malen’s future opportunities are bright. The hot rays of Jakarta’s morning sun streak down, almost blinding him. He’s only just able to spot his mother, Katarina Tri, up ahead. A white plastic sack slung over her shoulder makes her stand out in the crowded street. Malen runs to catch up with his mum. While she digs around in a bin out the front of the grocery store, Malen helps her look through the other bin. He knows what he is looking for. He’s done this before. His small hands work quickly to dig through the garbage. This is how Tri earns an income—collecting trash. The main goal is to collect plastic and glass bottles as they bring in the most income, but cardboard will do if bottles can’t be found. What other people regard as their garbage will soon support their family's livelihood. 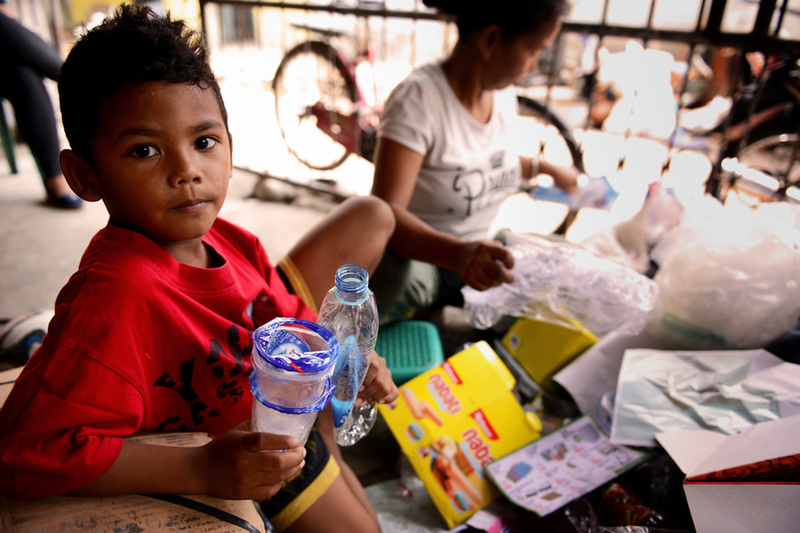 The trash abandoned on the streets of Jakarta is treasure for this family. “My husband earnings are not enough, so I have to do something,” says Tri. With two small children to tend to, she prefers a home-based job so she can still be close to her children. Collecting plastic trash seems the only reasonable option. 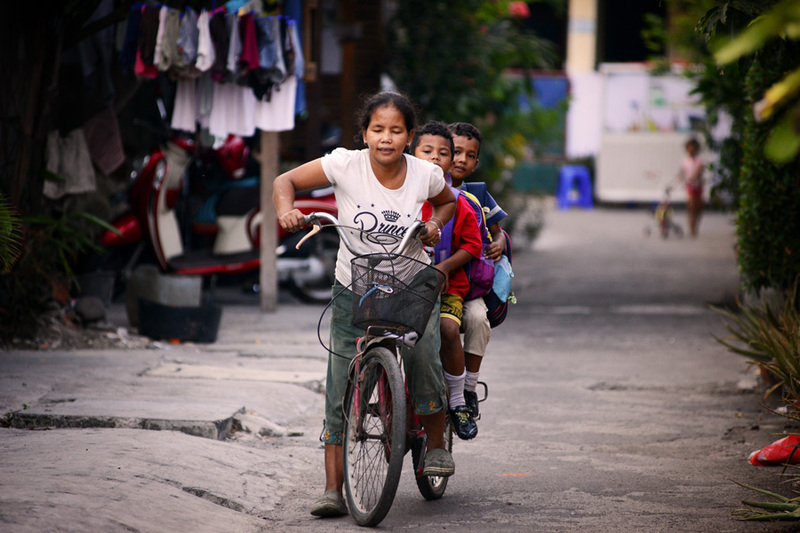 This is a lifestyle many families in Jakarta are accustomed to. The ‘trash pickers’ are the true working poor—rubbish is often their home, income and their children’s playground. Before she got married Tri worked in a plastics factory. She thought with her experience she could jump straight into the trash collecting business but it’s been a struggle from the start. “It took me months to learn the whole business, but it’s worth it,” says Tri. In order to keep her family afloat, Tri goes out to collect three to four times a day. “I hope you collect more garbage today Mom,” calls out Malen. 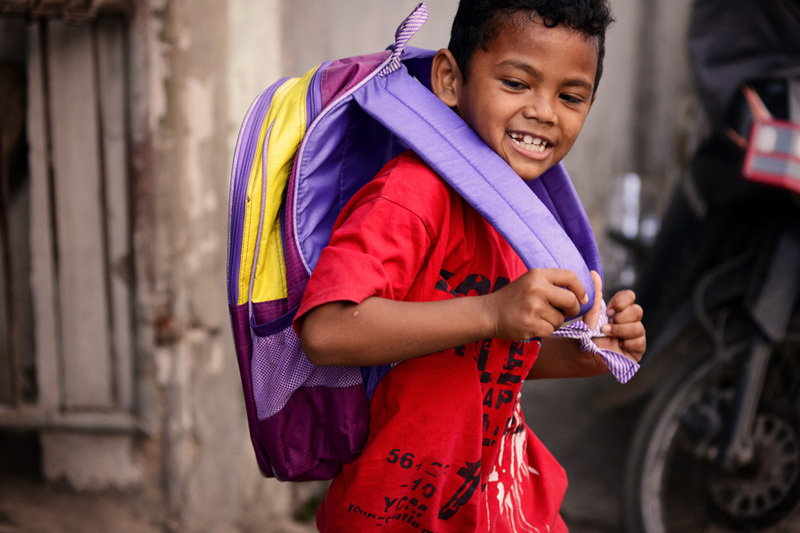 Malen knows his family depends on her success in collecting garbage. “I like to let my children see that life is hard, but God is still good to us,” says Tri. Driven by her knowledge of the bad influences for children in the neighbourhood, Tri is very protective of her children. “I know that many of the children here are drawn to playing on the internet and getting addicted to games. I don’t want that to happen to my children,” she says. She also knows many children start smoking in their early years and does not want Malen and his brother Nugie to end up adopting these habits. Even though they live in an area known for poverty and pollution, it does not mean they don’t have a choice in their lifestyle. Tri is determined for her sons to get every opportunity they possibly can. When the opportunity came for them to join the local Compassion child development centre, she did not hesitate. It is a blessing to the family—a loving place to nurture the boys’ minds and bodies. Every day, Tri loads her two sons on the back of her bicycle and takes them to the centre. Tri believes education is the key to a better future for her children. She always pushes them to study hard. School is the priority for her children. At home, Malen and Nugie are supervised as they study and do their homework. They sit close to her so she can still see them while she sorts and cleans the plastic and bottles. “I want to write to my sponsor,” says Malen. Malen’s handwriting is still a bit shaky but he is able to combine sentences word by word. He hopes he will be able to write his next letter to his sponsor. Malen receives less letters than Nugie, which is his motivation to write. He hopes his sponsor will understand and start writing him more letters. “Never lose spirit; that’s what I try to remind my children in every situation of their lives,” says Tri. When Malen wanted his own soccer ball, he knew Tri couldn’t afford it. So he began saving the little money he had and encouraging Tri on her daily trash collection. Finally, three months ago, Malen was able to buy his soccer ball with the help of his mother. Playing soccer is a carefree break from the responsibilities he carries to help his family business. For a moment, he can be a carefree six year old boy. 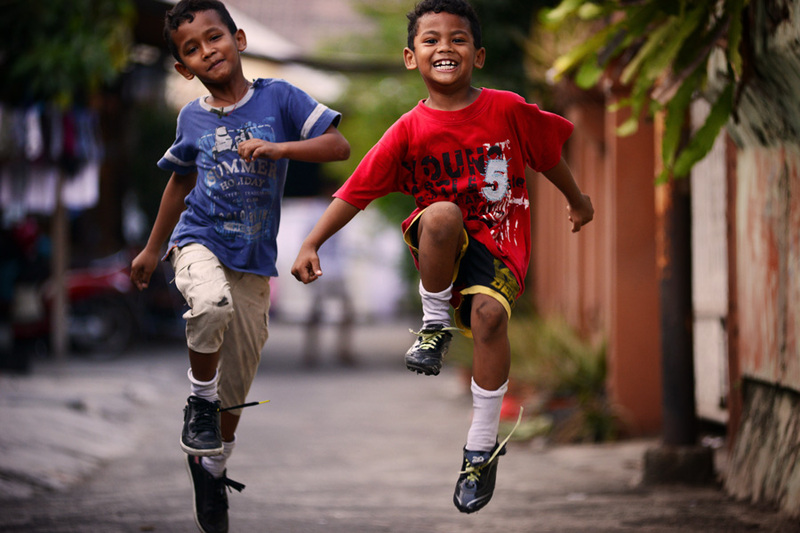 In the face of hedonism in the big city, children in Jakarta often spend their money on activities that are not helpful to their development. 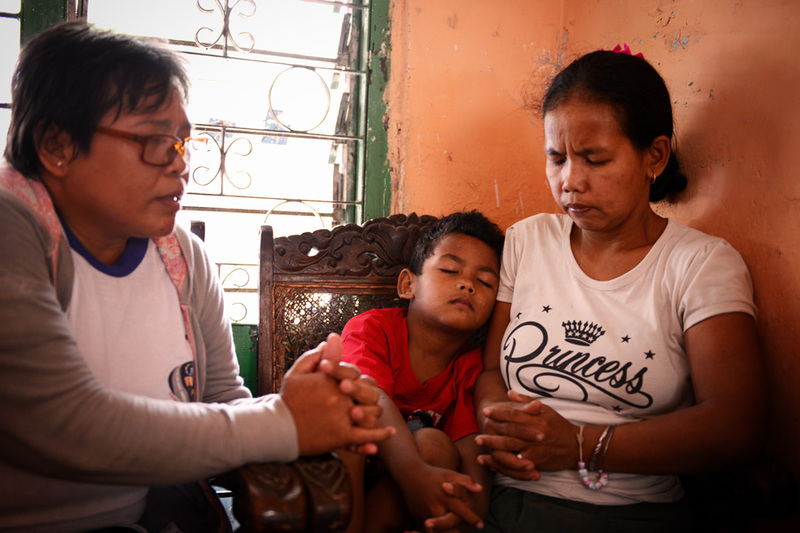 But Malen is protected by his mother, the child development centre activities, his school, and the Compassion staff, who always surround him with love and care. “I have a dream that one day Malen and his brother will serve God in everything they will become and do,” says Tri. Sponsor a child from Indonesia.